POWER SUPPLY INCLUDED to plug directly into the wall outlet. Power Supplies are different for different lengths. Once you get longer than 40 ft there will be a large power supply that will require you to go both directions from the power to get the full length. For Longer Lengths (81-330 FEET) Please message me, I have custom 24V strips available that are fully waterproof and can long distances like that with no issues. If you would rather wire to 12V this LED strip has red and black wire coming out to wire straight to 12V battery by simply cutting the female plug off. 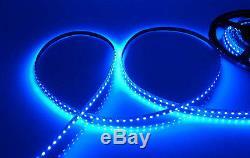 Create your own custom lighting with LED tape strips. Pre-applied 3M adhesive attaches to almost any surface and the sealed design is impact resistant. This 196.8 long strip features 300 single color LEDs and can be cut to custom lengths. Once applying, you just plug in the stripand you are ready to go. Strips can be connected to each other if you need longer. 300 LEDs in one 5M (16 ft) strip. Longer life (50,000 hours) and much lower power consumption compared to rope lights or any other lighting. Cut lines on circuit board for creating miniature segments. Impact resistant to use anywhere with 3M adhesive backing. Great for use as holiday lighting, indoor accent lighting, indirect lighting... 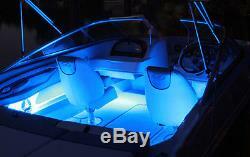 LED strip lights can be used for many applications such as. Waterproof Strips are silicone filled to protect the LEDs from water all along the top and sides of the strip. To fully protect the strip long term you will need to run a bead of silicone along both sides of the strip and all around any connection, plug and both ends of the strip. If you do not do this there is risk of the LEDs shorting out. Being a 12V light there is no safety issue. This suggestion is simply to protect your LEDs long term. Instead of "yellow board" my LEDs are on a much nicer and more durable white board with an oil brushed surface. The wire running through this is 100% copper instead cheap short lasting iron as most LED strips are. "A" is my LED strip with two layer board completely resistant to heat and protected from short circuiting. (Very Common for cheap LED strips). Silicone Filled NOT Epoxy (for Waterproof Only). Waterproof Strips are filled with Real Silicone instead of epoxy glue that becomes yellow and faded over time. The real Silicone is also the only way ensure a consistent color temperature over time. Chip Connection My LEDs have gold thread running through to connect each LED and chip together rather than copper thread. This will ensure a long lasting connection for LED to chip. For God so loved the world, that he gave his only Son, that whoever believes in him should not perish but have eternal life. 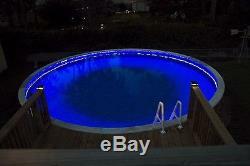 The item "Pool Outdoor WaterProof LED Tape Lighting Strip SMD 3528 300 LEDs per 5M BLUE" is in sale since Tuesday, July 17, 2012. This item is in the category "Home & Garden\Yard, Garden & Outdoor Living\Pools & Spas\Pool Equipment & Parts\Other Pool Equipment & Parts". 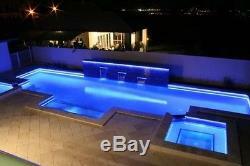 The seller is "21ledusa" and is located in Arlington, Texas. This item can be shipped worldwide.